Indianapolis The True Story of the Worst Sea Disaster in U.S. Naval History and the Fifty-Year Fight to Exonerate | Free eBooks Download - EBOOKEE! Posted on 2018-10-31, by nokia241186. A human drama unlike any other-the riveting and definitive full story of the worst sea disaster in United States naval history. Just after midnight on July 30, 1945, days after delivering the components of the atomic bomb from California to the Pacific Islands in the most highly classified naval mission of the war, USS Indianapolis is sailing alone in the center of the Philippine Sea when she is struck by two Japanese torpedoes. The ship is instantly transformed into a fiery cauldron and sinks within minutes. Some 300 men go down with the ship. Nearly 900 make it into the water alive. For the next five nights and four days, almost three hundred miles from the nearest land, the men battle injuries, sharks, dehydration, insanity, and eventually each other. Only 316 will survive. For the better part of a century, the story of USS Indianapolis has been understood as a sinking tale. The reality, however, is far more complicated-and compelling. Now, for the first time, thanks to a decade of original research and interviews with 107 survivors and eyewitÂ­nesses, Lynn Vincent and Sara Vladic tell the complete story of the ship, her crew, and their final mission to save one of their own. It begins in 1932, when Indianapolis is christened and launched as the ship of state for President Franklin Roosevelt. After Pearl Harbor, Indianapolis leads the charge to the Pacific Islands, notching an unbroken string of victories in an uncharted theater of war. Then, under orders from President Harry Truman, the ship takes aboard a superspy and embarks on her final world-changing mission: delivering the core of the atomic bomb to the Pacific for the strike on Hiroshima. Vincent and Vladic provide a visceral, moment-by-moment account of the disaster that unfolds days later after the Japanese torpedo attack, from the chaos on board the sinking ship to the first moments of shock as the crew plunge into the remote waters of the Philippine Sea, to the long days and nights during which terror and hunger morph into delusion and desperation, and the men must band together to survive. 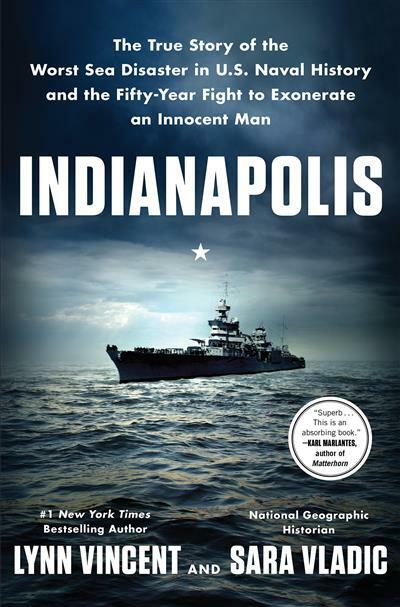 Then, for the first time, the authors go beyond the men's rescue to chronicle Indianapolis's extraordinary final mission: the survivors' fifty-year fight for justice on behalf of their skipper, Captain Charles McVay III, who is wrongly court-martialed for the sinking. What follows is a captivating courtroom drama that weaves through generations of American presidents, from Harry Truman to George W. Bush, and forever entwines the lives of three captains-McVay, whose life and career are never the same after the scandal; Mochitsura Hashimoto, the Japanese sub commander who sinks Indianapolis but later joins the battle to exonerate McVay; and William Toti, the captain of the modern-day submarine Indianapolis, who helps the survivors fight to vindicate their captain. A sweeping saga of survival, sacrifice, justice, and love, Indianapolis stands as both groundbreaking naval history and spellbinding narrative-and brings the ship and her heroic crew back to full, vivid, unforgettable life. It is the definitive account of one of the most remarkable episodes in American history. No comments for "Indianapolis The True Story of the Worst Sea Disaster in U.S. Naval History and the Fifty-Year Fight to Exonerate".